Is this the ultimate format for a proposal? We now deliver all proposals this way and wonder why more aren't using this approach. Watch this 2 minute video exploring the ultimate proposal format. A full cover, personalized visual, followed by pages and pages of analysis, approach concepts, cost tables, timelines and capabilities. They took a lot of time to prepare, but the most incongruent aspect was trying to communicate digital marketing through traditional medium. 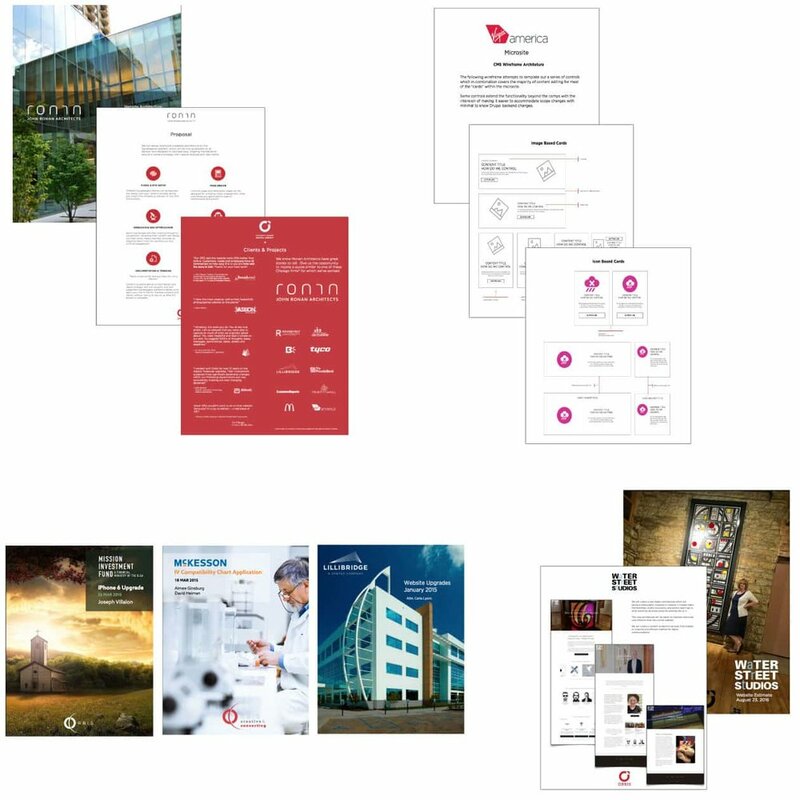 Sure, they're PDFs, but our proposals as well as any we've ever seen are designed in the traditional 8.5 x 11 printable format. Yet everything we're talking about is how you're going to impact the world reaching people using phones, tablets and widescreen desktops. That's when it became apparent we'd completely missed what we were espousing at the most sacred moment we were having a conversation — the proposal. More than any other situation, you have a committed audience — albeit small, but committed when you've reached the proposal stage. Like most people, they're spending more time on a computer, tablet and phone. Why not build for that medium and take advantage of all that can be done in that space? Chances also are, you'll stand out. This was the tipping point — the idea of dragging a bunch of screen captures from a competitive study into a gallery knowing you've just compressed and raised your next points higher in the flow of the delivery. Swiping is a beautiful thing. It's what all the kids are doing. People like to scan and focus on what's meaningful to them and everyone is different. How scannable is a proposal with reams of images and graphs? Galleries also allow a third level of layering — descriptions tied to each visual that can be attached or hidden until the visitor decides to engage more on a specific point. On the left, a gallery grid showing just pictures, names and titles which are clickable to open a full screen overlay with more detail on each person. The editor can turn this compression feature on or off and simply edits the longer text. Additionally, images can be switched to black and white and radiused without having to use an image editor. Voice recordings can be an intimate connection on an otherwise distant expression. Tied to a visual tour of some of your charts or screen captures, tapping the play button, as statistics tell us people like to do, get's your presence of mind to them in a way no pdf can. This proposal video was another powerful realization that reaching a body of board members had a much better chance if I could walk them through at a time convenient to their individual schedules. Watch our first proposal video walk-through. We've created a special suite of interactive, information compression tools that are easy to edit and easy to use. It's an approach that predates digital; magazine print layout is typically regarded as beautiful and inviting when there's visual breathing room. This broke the ceiling in writing proposals when more detail could be added without feeling confined by too much density. These have been gaining favor in landing page design because they keep the visitor from navigating away so you can better draw them through a narrative. A perfect solution for highlights along with a line to considerably more detail — but not too much though. Best practices suggest modals stay simple in mobile environments. Similar to modals, these are perfect when you want to group headline / content parings that are perused in groupings — like FAQs. These get a bad rap as home page hero images and for good reason, but as a group of visuals around a specific point — nothing's better. A flow of steps targeting deliverable dates is a staple in most proposals. Add to that panels that expand and contract and you have a whole new level of support in your assertions that remain user friendly and comprehensive. Animations in digital started as a gimmick, but have evolved into powerful feedback tools. Animation is about the space in between — the transitions. Paired with revealing compressed and deeper information, you're intermixing both your narratives by allowing them to choose and unfold in a way people like — smooth, and not harsh. Vision is very inefficient without movement. It's why prey will remain still in not wanting to draw attention. Sliding, fading, and responsiveness to the physical touch is a powerful and visceral motivator at the point of contemplation within a proposal. That's our estimation but it's hard to tell because it seems this format draws more time into crafting the actual message. It can become obsessing in tweaking what you want to say when you can just click and change. And, it's very collaborative. Multiple authors can be working and contributing at the same time from anywhere. Whole sections can be duplicated and dragged into a new proposal and then tweaked specific to the prospect. Have a library of documents, videos or even people that are specific to this particular pitch? It's easy to drag a library into a proposal and then filter by a category or tag. As discussed earlier, audio snippets can be extremely efficient an easy to record and then sprinkle throughout. What a welcoming bridge you can create to your firm when someone can hear these ideas naturally spoken to them. We experimented by taking a 60 page proposal and re-building portions of it into a mock web landing page proposal (as shown in the video above). Take your proposals up a notch.